I’ve got a lot of books on my bookshelf. Most of them are pretty useful (hey – if they weren’t, I wouldn’t buy them…) but some get used more than others. Being a music and worship guy, I have a lot of books on the subject. Some are big or have impressive sounding titles. 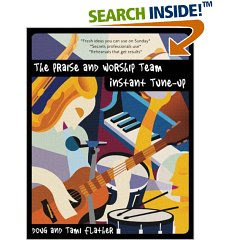 I use these from time to time, but the book that I most often turn to the most is neither big nor impressive sounding: “The Praise and Worship Team Instant Tune-Up” by Doug and Tammy Flather. It is one of the most practical books that I own and I find myself using it more than most others. For those who lead worship teams, this book is essential. The book is full of tips for musicians and vocalists alike, as well as tips for the person planning the service. There’s information on everything from vocal technique to hand signals, stage arrangement and chord substitutions. The book is about 5 years old, but the information is as current today as it was then. If you’re involved in leading worship you should get a hold of this book!